I tried to make Ajumma dolls before I made a Digital Ppal-let-ter video. Now, I’m thinking to do something very exciting and fun project for Ajummas. I can’t say the clear idea for this new project yet but one thing I can say for now is that this project will be enjoyable for everyone (not too serious or academic project). Through this blog, I will keep posting articles about ajummas (from academic research to miscellaneous stories) and at the same time I will upload the new project for ajummas as well. Ajumma, how much is it? Today, I went out with my parents to have lunch together. We had Chinese food in Myeong-dong and headed to Dongdaemun area to visit Gwangjang Market. Gwangjang Market is famous with variety of street foods and other stuff such as Hanbok (Korean traditional dress). And this market is also well known to travellers who visit Korea. We also love visiting Gwangjang Market just for browsing. When we visited to this market today, my mum wanted to buy a blanket for spring. Yes, they sell blankets in reasonable price but the quality is very good. Anyway, when my mum went into one shop to browse blankets, me and my dad were waiting for her outside because the shop was very tiny to fit ourselves into. At that time, five foreigners were looking at pillows and blankets of that shop. They’ve asked price for those items to the shop owner. I smiled when I heard that word, Ajumma! Then, the ajumma came out of the shop and told them (almost yelled) the price in Korean. They couldn’t understand and the ajumma tried to explain the price with her fingers. So I just translated the price from Korean to English. Both the ajumma and those travellers became happy because the ajumma could sell the blanket and they could buy the blanket. The point what I want to tell you is how the word Ajumma is getting familiar with people even though they are foreigners! Ajumma is our culture and this word presents the familirity and warmness of middle-aged Korean women I think and I saw. I went to one of the conference in Korean last week and I got attacked from some of audiences about using the word Ajumma. They mentioned that using the word of ajumma could be lead disdaining the Korean middle-aged women. (I will write more about this issue for next blog post, there are so many things that I really want to write about). 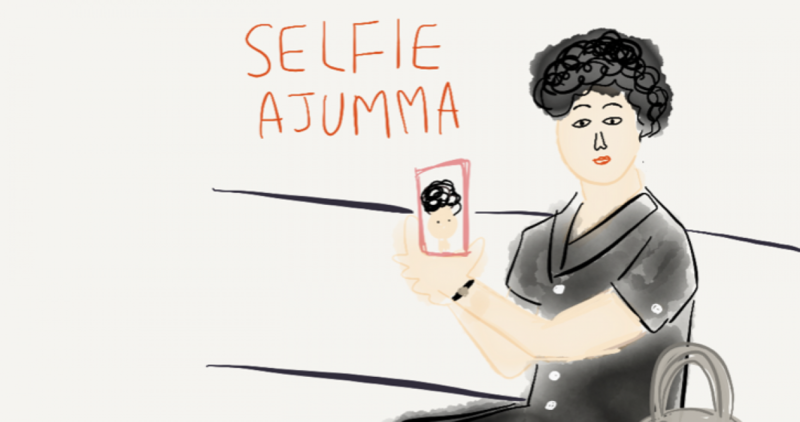 Anyway, ajummas are our culture I no longer thinking the word ajummas are the one that disdains the middle-aged women in Korea. Digital Ppal-let-ter is a new digital space which illustrates the interactively remediated space and time of both the wash place before the 1960s and Kakao Talk’s group chat room in the 21st century. Digital Ppal-let-ter will encourage audiences to consider the existence of middle-aged and married women’s communal space that has formed and has been developed by those women from the non-digital (pre-smartphone) era before the 1960s to the digital (smartphone) era in 2015. Digital Ppal-let-ter will take both analogue and digital technology to present a new digital space where ajummas communicate with each other. It is an imaginary space located in a time of coexistence between the face-to-face communication era and the mobile digital communication era. In other words, Digital Ppal-let-ter is located in an in-between space and time of actuality and digitality. For this reason, the creative project of Digital Ppal-let-ter is a converged metaphorical space of communication that transcends time and space among middle-aged and married women in Korea. I tried to do an installation art but I’ve changed to produce a video instead. Digital Ppal-let-ter is an imaginary space that does not exist in the real world. However, it asks audiences to think about how communication amongst middle-aged and married women in Korea has always existed even though various communication tools and the locations of communal spaces have changed over time. Digital Ppal-let-ter aims to emphasise that specific features of communication have developed subliminally through continuous interactive communicating among middle-aged and married women in Korea. Digital Ppal-let-ter is based on Korean sentiment but the convergence of digital and analogue technology in the project is universally relatable. To create this complicated but poetic and new experimental media art project that includes interdisciplinary academic research and mixed media art forms. For my PhD thesis, I had to write a dissertation (thesis) and make a create project. This creative project is generally called as a project-led research but my PhD project is different. I rather call my creative project as ‘research-led project’. Digital Ppal-let-ter project (Creative project) is mostly based on academic research then I put my imagination to create this Digital Ppal-let-ter project. Without advanced academic research about ajummas and their use of smartphones in everyday practices, Digital Ppal-let-ter couldn’t be created at all. To create this project, I tried to use many different ways of ‘making’ an art work. I’m not an artist and my background is fully media studies. I had various experiences of working in the media industry and I worked as a script writer, producer, video editor, etc. I know how to use tools for making a film but I don’t want to make an actual film for this project. I rather try to experiment using non-professional filmmaking tools for this project. I always admire people who propose a new method so I tried to find a new method for this project. Through this blog, I will explain how I made this video with my own ways of using tools and softwares. Firstly, I used still photos for Digital Ppal-let-ter project. The photos for the Digital Ppal-let-ter project were all taken on a iPhone 5 over a period of 2 years from 2014 to 2015. The majority of photos were taken in Seoul, South Korea. The subjects of the photos are mostly middle-aged women, ajummas, in Seoul. The photos were taken randomly in Seoul during the field research in 2014 and 2015. The reason why an iPhone was used as a camera for this project is because it has many advantages such as portability, convenience and instantaneous viewing. Using an iPhone camera for making this creative project has reminded me of the diverse theories about digital communication technology, especially the use of mobile communication devices (e.g. smartphones). An iPhone allowed me to take photos whenever I found suitable subjects.I became a ‘phoneur’ (2006, Luke) as I took photos while observing people and the city in Seoul and it became a natural part of daily life during my stay in Seoul for the field research in 2014 and 2015. The subjects of the photos that were used in the video were not asked for permission, however their faces were covered by a hand-drawn sticker of a smiley face to protect each subject’s privacy. Most photos of ajummas that were used in the video are not taken from the front and some of them are blurry. Consequently, the subjects in the photos that were used in the video are not recognisable. In addition, the video in the Digital Ppal-let-ter project is not made for commercial use, rather it is produced entirely for a creative project which is a part of the PhD research project. For this reason, the privacy issues of photos that were used in the video should not be a problem at all.